If you are looking to taste the best coffee always, it is better to use freshly ground coffee rather than going for pre-ground coffee. Coffee will stale after it is ground and hence loses its actual aroma and taste. There is nothing like sipping a hot cup of freshly brewed coffee early in the morning. If you are looking to capture the best qualities of the coffee, then it is advisable that you invest in coffee grinders, which is also known as the coffee mill. 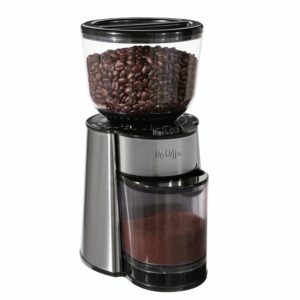 The best way to grind the coffee beans is to use the best burr coffee grinder. The normal blade grinder will work through the coffee beans and cut them into indiscriminate pieces. You will always get an inconsistent grind when using a coffee grinder that uses a blade grinder. The burr grinder, on the other hand, has sharp cutting surfaces and precise adjustments to work on the coffee beans to give the most consistent grinds. The two burrs in the grinder oppose each other and therefore the coffee beans are cut from both the sides. They will offer the best and consistent coffee flavor. This is why we see more and more preferring the burr coffee grinders to grind the perfect coffee. The Capresso 560.01 Infinity burr grinder is the best burr coffee grinder that ensures you enjoy the maximum aroma and get top quality flavor retention in the ground coffee. This burr grinder has specially designed grinding heads to cut the coffee beans in various angles and shapes to bring out Turkish fine to percolator coarse coffee to meet various coffee preparation needs. The burrs are handmade and are developed as matched pairs to offer best coffee powder production. This Capresso Infinity burr grinder can handle about 8 ½ ounces of coffee beans at one go. It comes with 4 different settings in 4 different categories, namely extra fine, fine, regular and coarse. You have the option to adjust the grind of the coffee to a specific blend and brewing method. The steel conical burr design offers greater stability and durability of the machine. It comes with added features like slowest grinding speed, lower grinding noise, very little static build-up, safety lock system and grinding timer to grind from 5 to 60 seconds. The BMH23 Mr. Coffee automatic burr mill grinder main attraction is the 18 custom grind settings from fine to the coarsely ground coffee. This allows you to grind the coffee beans in the way you want to and to a brew that you like. This machine ensures that you can enjoy the freshest coffee flavor, better taste and richer coffee aroma in every sip that you take. The burr mill will not generate heat and therefore all the characteristics of the coffee beans are not lost when grinding. The machine will grind automatically and all you need to do is to choose any grinding setting. It has two bins, one to hold the coffee beans and the other to catch the coffee grounds. It has the capacity to produce 4 to 18 cups of ground coffee. This grinding coffee machine offers hands-free operation and weighs 4.3 pounds. 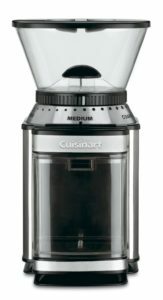 If you are looking for the best burr coffee grinder for your home, then Cuisinart DBM-8 Supreme Grind automatic burr mill fits the bill. This is an attractive piece of coffee grinding machine that is neatly designed and will adorn your office or home kitchen in spite of being a heavy duty machine. It looks elegant with its stainless steel styling. This machine uses the burr mill grinding mechanism and this ensures that the coffee grounds are uniform and offers an optimal flavor and aroma. It has 18 different coffees grinding options from the coarsest coffee of the finest coffee that is used to make espresso. The grind chamber is a see through container that is removable. It can hold coffee grounds that can make up to 32 cups of coffee. The machine has an electric timer that will shut the unit off once the grinding cycle is complete. It has a high performance, heavy duty motor that grinds 12 cups of coffee powder in just 40 seconds. 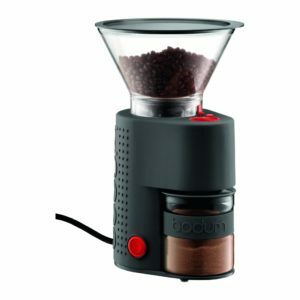 This attractive looking black burr coffee grinder from Bodum comes with an adjustable burr grinder to bring out the flavor, taste and aroma of the coffee beans for all your favorite brewing methods. The unit features a quick grind button to grind the coffee beans at a quick pace. You can also make use of the timer grinding option to choose the amount of time that you want the coffee beans to be ground in the machine. The beans are crushed using stainless steel conical burrs to preserve the flavor and aroma of the coffee. The grinder is adjustable and there are 12 settings to get the ideal ground coffee from the course to ultra-fine form. The grounds are collected in a borosilicate glass container that is static free and prevents the jumping of the coffee grounds. The tight silicone lid of the machine ensures that there is no spillage or messy work when running the grinder. 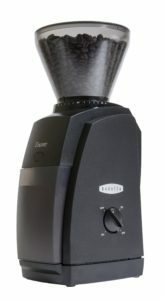 The Baratza Encore conical burr coffee grinder with bin is an affordable and attractive looking burr grinder that you can use at your home to get the best ground coffee. This is a good option for everyone looking to brew fresh, flavorful and tasty coffee at home. The Encore burr grinder features 40 different grind settings and whatever be your coffee grind need from course to an ultra fine powder, you can get anything out of this machine. The grind beans are ideal to use for your manual or drip brew. The heavy duty DC motor used in the machine will keep the coffee beans free from heat and therefore the coffee beans will not lose any of its important characteristics. The burr is slowed by the combination of electric and gear speed reducers to ensure very good bean grinds and also low noise and no static build-up. The capacity of the bean hopper is 8 ounces and that of the ground bin is 5 ounces. 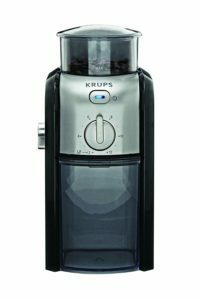 The KRUPS CVX2012 coffee burr grinder has a flat mill system to quickly and efficiently grind the coffee beans. The aroma and the flavor of the coffee beans are kept safe in the 8-ounce bean hopper of the burr mill. The anti-static, ground container can hold up to 8 ounces of ground coffee. The burr mill will not get overheated when grinding the coffee beans and therefore the characteristics of the beans will not change during the grinding process. There is a grind fineness selector provided in the machine with 17 different settings to produce ground coffee from coarse to a fine powder form to help you brew the perfect cup of coffee every time. The ground coffee container and the bean hopper lids have to be tightly sealed for the burr grinder to work. After the machine grinds the required amount, it will automatically shut off. 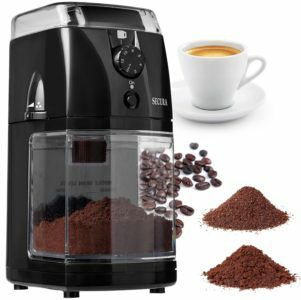 The Secura SCG-903B electric burr grinder is a machine that will help to grind the coffee beans just like a pro. It is very easy and simple to operate and offers you as many as 17 grind size options to get extremely fine coffee to make espressos to coarse granules suited for French press. The automatic burr grinding mechanism ensures that the coffee beans are uniformly ground and the natural aroma and flavor of the coffee is preserved in the ground. 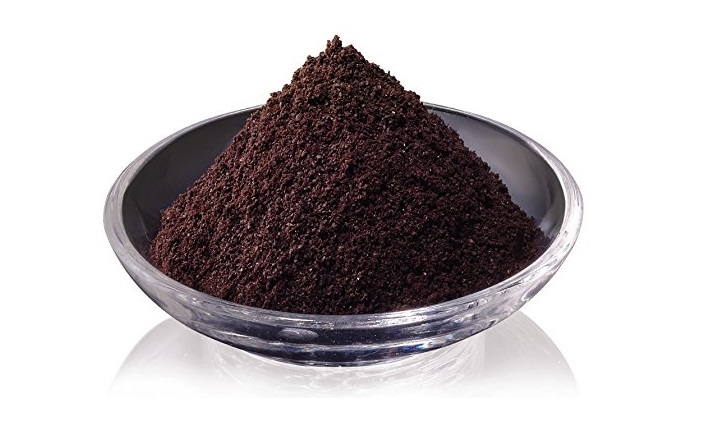 You have the option to select the quantity of the coffee grounds to suit2 to 12 cups. This coffee grinder from Secura will require very less counter space and is a very handy tool to have in your office or home if you prefer to drink fresh brew coffee. The hopper that collects up to 12 cups of coffee ground is easily removable. The coffee bean bin is seen through and can hold up to 100 grams of coffee beans. The OXO on Conical burr coffee grinder is an attractive looking grinder with stainless steel styling and is a compact machine that will not take a lot of your counter space. It comes with an inbuilt scale that will allow you to measure the grounds by weight. There is no need to use a separate scale to know the coffee ground weight. 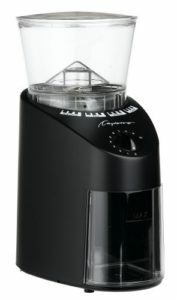 It is a highly durable conical burr grinder with 38 different uniform ground settings. So, producing coffee grounds to make espressos or French press or cold brew will not be an issue. The motor has high torque, minimal static and low-speed features that ensure that the coffee beans never get heated. This way the flavor and aroma of the coffee beans are intact. There is a dial that can be used to switch between manual mode, grams mode, and cup mode. The coffee bean hopper can hold 16 ounces and has a trap door to hold the beans when the hopper is detached from the unit. 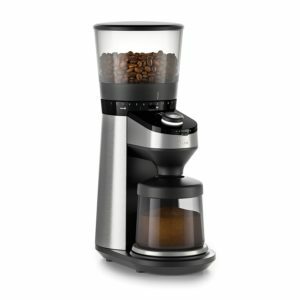 The burr coffee grinder is an essential machine to have in your homes and offices if you love to drink hot coffee that has the rich aroma and flavor of coffee. You should choose burr coffee grinders depending on the storage space, the budget, the quantity of coffee needed and, of course, it’s useful features. The features to look for to buy the best burr coffee grinder are: materials used to make the unit, the durability and the usability factor, the different types of coffee grind settings, auto shut with on/off indication, the burr grinder blades, the ease of operation and cleaning, etc. The Hario Skerton Grinder is outstanding! Great for small batches or individual cups of coffee. So well made and designed. Several of these grinders are available at Crate & Barrel.